The Mt. Shasta Police Department and The National Bike Registry (NBR®) have teamed up to offer local residents a free way to protect their bicycles, in case they are stolen. The launch of the program is particularly timely, since new bikes are always popular holiday gifts. Mt. Shasta police are giving away an NBR bike registration pack to any bike owner in the city who requests one. The NBR program gives the Mt. Shasta Police Department, as well as other police departments nationwide, access to the extensive NBR registry, so they can track down the rightful owners of bikes they recover. The Mt. Shasta Police Department will use NBR, the only nationwide bicycle registration and recovery service of its kind, to complement its own bike registration system. This gives the Mt. Shasta program a national scope, so bikes that are registered in the city can be matched to their owners no matter where they may be recovered. "On average, 15 to 20 bikes are stolen each year in our community," said Parish Cross, Mt. Shasta's Police Chief. "Of those bikes, only one or two are returned to their owners because most bikes are left here unclaimed, with no label or identification. It is simple to put an NBR ID label on the bike to register it, and we want to encourage all of our residents to do it." Residents of Mt. Shasta and the surrounding area can pick up a free NBR bike registration pack at the Police Department. The Mt. Shasta Police Department is providing this service (a $10 retail value) to encourage all bike owners to register. The police department is requesting a $5 donation to the D.A.R.E. anti-drug program, but no donation is required to receive the NBR registration pack. The registration includes a 10-year NBR registration, a tamper-resistant, serialized security label for the bike, and a bonus label that gives the user BoomerangIt Lost & Found Return Service for cell phones, PDAs, laptops, or other valuable gear. "Police have a tough job in recovering property and then going out to find the rightful owner," said Eddie Orton, president of NBR. "This will save Mt. Shasta Police Department's time and effort in reuniting bikes and their owners, and provide a valuable community service." To take advantage of the NBR service, a bicycle owner can apply the labels obtained from the Mt. Shasta Police Department, then register the bike by phone, mail or online. Registration ensures the bikes serial number and description are in the company's secure database. Often just seeing the NBR label can deter a thief, who knows it will be harder to resell an obviously stolen bike. The finder of a bicycle, either the police or a Good Samaritan, calls 800-848-BIKE or accesses the NBR website at www.nationalbikeregistry.com to trigger a notification to the owner. NBR is the official bicycle registration service of the National Crime Prevention Council and McGruff® the Crime Dog. A division of BoomerangIt, The National Bike Registry is the leader in bicycle registration. We have more than 300,000 bikes and scooters registered in our system. The National Bike Registry works with law enforcement agencies around the country to return stolen bikes and scooters to their rightful owners. 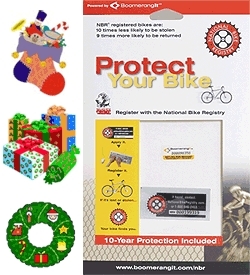 NBR bike registration packs can be obtained at participating retailers, police departments, or online at www.nationalbikeregistry.com and www.boomerangit.com.